Soaring Penguin Press has announced plans for the English-language publication of A Small Revolution by Boum. 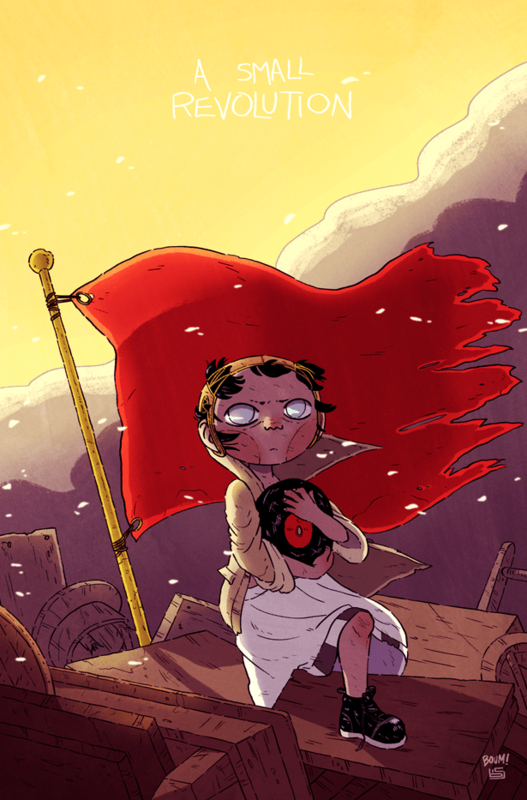 Nominated for Outstanding Online Comic in this year’s Ignatz Awards, A Small Revolution follows the young orphan named Florence who joins a revolution she’s too young to fully understand. “A Small Revolution is a story of dictatorship and revolution as seen through the eyes of a little girl, and her love for Boris Vian’s music,” explained Boum, the pen name for Samantha Leriche-Gionet of Montreal, Canada. The new edition will be released in the second half of 2017. The story’s origins go back to a novella Boum wrote for a creative writing class. The comic was first published in 2012, but only in French under the title La petite révolution. The French edition was nominated for the Best Independent Comic Award at the 2012 Bédélys Awards. It was then released online last year both in French and English. Boum began in animation, with her animated shorts screening in film festivals around the world. Since becoming a mother, her creative output has focused on comics. Since 2011, she’s released her online journal comic Boumeries, where she just posted her 1,000th comic. To celebrate, she’s running a contest: 4 copies of Boumerie Vol. 6, the newest collection, are being given away on her website and social media accounts. Boum is a comic artist, illustrator and animator living in Montreal, Canada. She studied traditional animation for seven years, at the cegep du Vieux Montreal first, then at Concordia University. Her animated shorts have been screened all over the world. Currently, she has entirely devoted herself to her new job as a mom and makes comics during nap times. A Small Revolution will be published in the latter part of 2017. An earlier version of this story stated that the French edition of A Small Revolution won a 2012 Bédélys Award, when in fact it was nominated. The story has been corrected.